Despite the escalation of cybersecurity staffing and technology, enterprises continue to suffer data breaches and compromises at an alarming rate. How do these breaches occur? How are enterprises responding, and what is the impact of these compromises on the business? 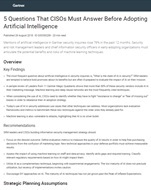 This report, one of three to come out of Dark Reading's annual Strategic Security Survey, offers new data on the frequency of data breaches, the losses they cause, and the steps that organizations are taking to prevent them in the future.